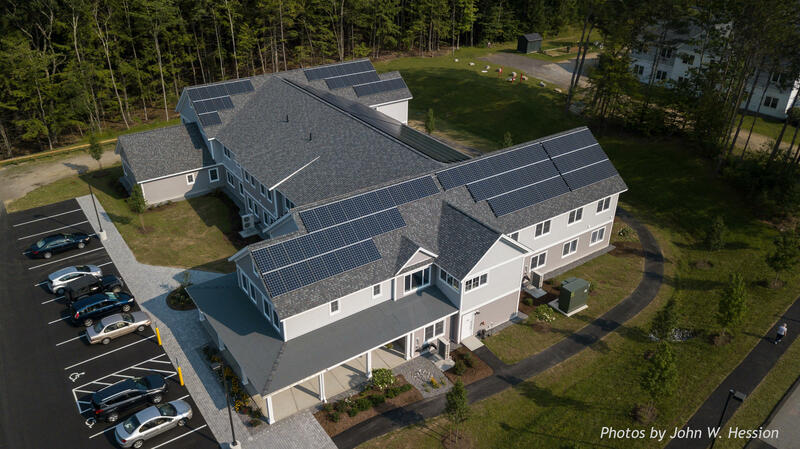 An aerial view shows solar panels on the roof of the new "passive" senior housing complex in Gilford. It uses airtight construction and energy efficient insulation that aims to sharply lower residents’ bills. The building is the third phase of an affordable senior housing development called Gilford Village Knolls. It includes 24 one-bedroom apartments, with a small rooftop solar array to cut residents' energy costs through net metering. 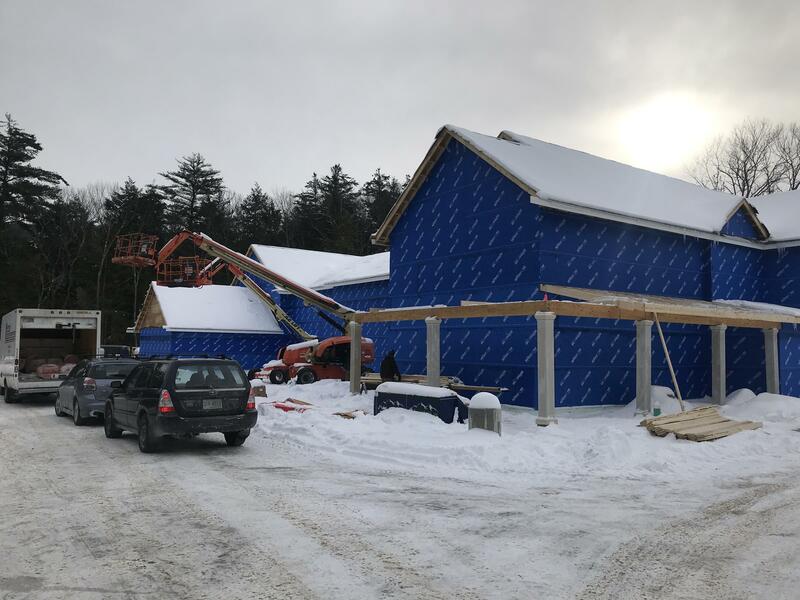 The nonprofit Lakes Region Community Developers built the multi-million dollar complex with state funding and tax credits. Construction of a passive house-style building begins without windows and doors to ensure completely airtight insulation. Real estate development director Sal Steven-Hubbard says the project's biggest benefit for residents is in the passive house style of insulation. It completely encloses the building and seals to its high-efficiency windows and doors. As a result, Steven-Hubbard says, passive houses on average use 86 percent less electricity for heat, and 46 percent less for cooling. An older part of the complex is the same size and capacity as the new building. Steven-Hubbard says they'll be able to compare energy use and cost for the two structures over time. Residents of Mascoma Meadows manufactured housing community in Lebanon are celebrating the construction of a new solar array, the first in the state to power mobile homes in a resident-owned community. At a ribbon-cutting ceremony Wednesday, city and state leaders heralded the project as a bellwether for efforts to connect low and moderate-income households with renewable energy. The building’s 29 units will not only be energy-neutral, their electric use offset by solar panels, but also affordable. Resident incomes will be capped at about 60 percent of the area median, or about $42,000 for a family of four. A new study from the University of New Hampshire and the real estate website Zillow shows the impact rental housing affordability has on a community's rate of homelessness. Researchers found that once residents are paying more than 32 percent of local median income to rent, the expected homelessness rate goes up sharply. UNH assistant professor of decision sciences Chris Glynn says this is most extreme in places like Los Angeles, where rents are nearly half of the median income and the homelessness crisis is clear. Plymouth will soon be home to the state's first small solar panel arrays designed to help low-income families. The nonprofit behind the project hopes other towns will follow suit. Solar Shares has raised more $115,000 for the arrays and plans to break ground on the first one, near the Common Man Inn, in the spring.